Ministers and elders from across Scotland gathered in Clydebank on 31 October for a two-day Presbyteries Conference, convened by the Council of Assembly. The aim of the conference was to help lay the groundwork for a radical action plan to guide the future of the Church as it meets the challenges of mission in our ever changing world. The call for a ‘radical action plan’ came from the 2018 General Assembly, which last May rejected a proposed 10-year strategic plan, instead directing the Council of Assembly to return in 2019 with a more “radical” plan for 2019-22. Church members were also asked to consider the ideas of Rev Dr Doug Gay, a Glasgow University lecturer who delivered the 2017 Chalmers Lectures. The proposed over-arching theme of the action plan is Jesus' call to ‘Follow Me’ to run over the three years encouraging people to develop and deepen their faith, supporting churches engagement with their communities, and discovering new ways of being witnesses to Jesus with the courage to leave old ways behind. The Presbyteries conference was one of many local and national events which will contribute to the discussions taking place across the Church this year. While the Council of Assembly was tasked with presenting a plan to the General Assembly in 2019, presbyteries, and kirk session were urged to pray, listen to God’s call and reflect together on their mission and vision for the next three years. The Together We Pray 2018 day of prayer was held soon after the conference on Saturday 3 November. Rev Dr Doug Gay will give the 2018 Dennis Duncan lecture on Discipleship and Healing on Nov 15 in Aberdeen. In January, Falkirk Presbytery is hosting a conference at Tulliallan to further the conversation. 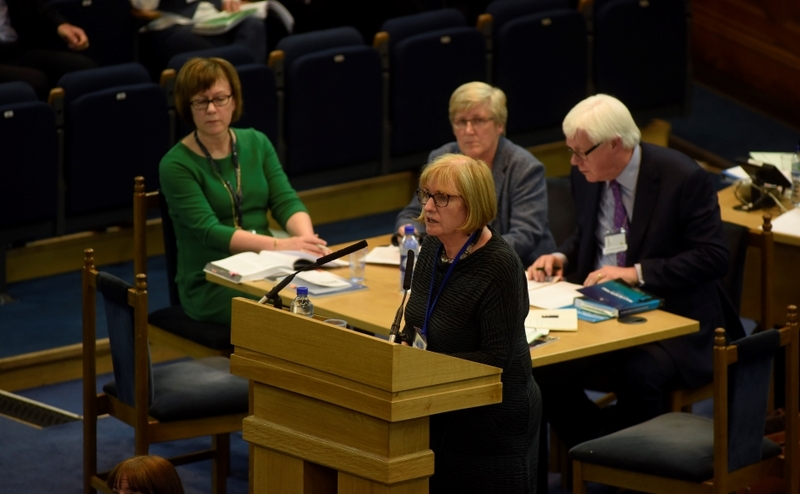 Church structures and governance are also under review after a Commission of Assembly, which met on 3 October, agreed to form a Special Commission which will make recommendations to ensure the Church’s national structure is ‘lean and fit for purpose to lead reform’. The recommendations will be debated at next year’s General Assembly along with other proposals for the radical action plan, and, if accepted, will guide trustees, councils and committees of the Church. Going forward plans are in motion to bring together a smaller representative group from presbyteries which will act as a reference group to help the council with specific action planning. There will also be a second one-day presbyteries conference early next year in preparation for the General Assembly. Around 55 representatives from 41 presbyteries attended the conference, along with representatives from each of the Councils, the Panel on Review and Reform, Ecumenical Relations, The General Trustees, Stewardship and Finance department and the Communications department, and took part in large and small group discussions. The Principal Clerk, Rev Dr George Whyte, introduced the proposed theme: which in the first year would be “Jesus said, ‘Follow Me’”. Rev Martin Johnstone, acting Secretary to the Council of Assembly, and Rev Jenny Adams, Convener of the Panel on Review and Reform, asked participants to discuss what ‘radical’ means for the Church. Rev Jayne Scott, Secretary of the Ministries Council, introduced a session on radical planning for local churches. Lesley Hamilton-Messer, leader of the Church without Walls team in the Mission and Discipleship Council and Phill Mellstrom, worship development worker, introduced a discussion on discipleship. Sally Bonnar, Convener of the Council of Assembly and Rev Martin Johnstone led the session on next steps. Dr Whyte introduced the theme noting that all Christians share the call to be disciples of Jesus. This one passage, he said, can help the Church move forward together, by highlighting three different aspects of Jesus’ call over a three-year period of reform and renewal. Year one would focus on the call to “Follow Me”, encouraging church members to pray and reflect on their personal faith in Christ, on the beliefs and traditions of the Church and the Church of Scotland community that supports our faith. During the first day some people expressed disappointment that the format of the conference was not what they expected. Some had expected concrete proposals to come before them. Rev Martin Johnstone apologised for any disappointment but told the gathering everyone in the room has a part to play in deciding the future of the Church of Scotland. What does radical discipleship look like for parish ministers/elders/members/people on the edge of the Church? What does radical expression of the local church look like in the call to Follow Me? What are the radical ways we need to use our resources, including our money, to equip us for this task? How are we going to enable the local church to hear and respond to difficult times? How do you think leadership in the local church needs to be exercised? Participants shared their views and captured the ideas discussed on post-it notes and paper tablecloths, which were collected for review and inclusion in the national planning work.They shared a rich and diverse variety of perspectives, both during formal sessions and informally during breaks. Organisers hope the conference was an opportunity to raise ideas that will be expanded on in the local discussions underway. Several key themes emerged during the discussions. There was a call to reduce the burden on local congregations of administration tasks and building maintenance in order to free people up for missional activities. It was suggested that dealing with GDPR, Safeguarding and building issues could be handled by staff devolved to Presbyteries. At the same time there were calls for Presbyteries to have more flexibility over deployment of ministers and interim ministry teams and for resources to be devolved to the local level for mission and outreach. The 2001 Church Without Walls report was mentioned as a key resource several times. Several people advocated for Kirk Sessions to be reduced in size, with governance rotated among the group of elders and limited to specific terms of service. Others said this would not work for their congregations. A number of people said responsibilities should be shared based on talent and inclination so that some elders might focus on pastoral care, others on safeguarding, youth work or leading worship. Could some central functions be outsourced? Discussions on the radical use of resources highlighted many efforts underway in the Church as well as some visionary ideas: The Well; Foodbanks; Fair Trade; World Mission; an ethical bank giving low interest loans to Church projects; Church credit union; Hamilton Presbytery’s work to train and empower local worship leaders for outreach; Fresh Expressions; café church; the Go For It fund; Priority Areas; funding youth work; as well as many mentions of selfless giving by individuals. The discussion on radical discipleship produced many examples of people – both famous and unknown— including:Job, Martin Luther, Dietrich Bonhoeffer, Martin Luther King, William Wilberforce, Billy Graham, Jane Haining, Pope Francis, Very Rev Albert Bogle, Peter who held an ‘all-night prayer ministry’; Margaret who was ‘an inspiration to all who knew her’; Jim known for his ‘constant encouraging faithful service’, Ian who worked for peace and many more. A representative group of people will be asked to serve on a small group to help guide the formulation of the plan. Join the conversation in your local congregation and presbytery. Updates will be posted to the Church website in January. “None of us are in any doubt about the huge challenges facing the Church of Scotland at this time. “These two days together highlighted a common desire for change and a wide diversity of views as to how that change can best happen. “We all have a part to play in shaping the future that we believe that God is calling us into. This will involve courageous decisions and a deep reliance on the Spirit of God.